Tonight I had to be adaptable. Work continued unexpectedly late and when I finished just as the sun was setting, I knew I couldn’t do my planned first, which was to take place outside. No worries! Greg took me to El Vaquero for a late dinner. 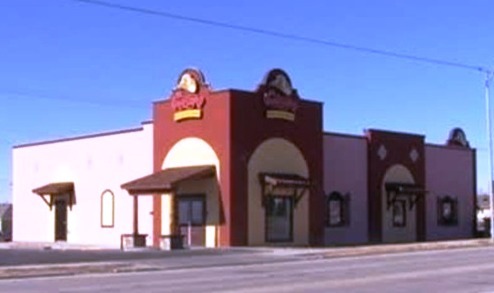 For my first today, I tried a new dish at this favorite Mexican restaurant. 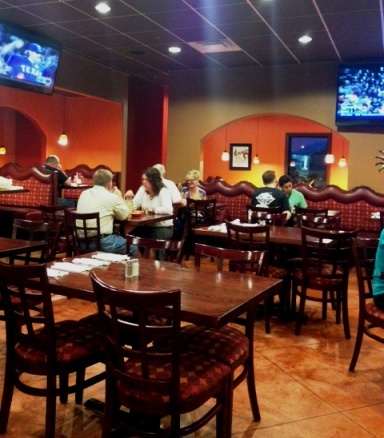 I have been so happy to have El Vaquero back after the tornado. It is located conveniently close at 2412 S. Main Street. They reopened bigger and better than before, just down the street from the previous location. I either don’t correctly remember their prior menu, or they greatly expanded their offerings. There is a wide variety of delicious dishes to choose from. And if I don’t feel like Mexican food, El Vaquero has salmon, steak, chicken and shrimp dishes to choose from. I am never disappointed with my meal here. Tonight, I perused the menu, looking for something I have never eaten before here. I tend to go with one of three different entrées. I considered the vegetarian quesadilla but decided to save that for another time. Then I saw the Mexican Flag dish. The entrée included a beef enchilada with chili con carne, a cheese enchilada with queso and a chicken enchilada with green chile sauce. 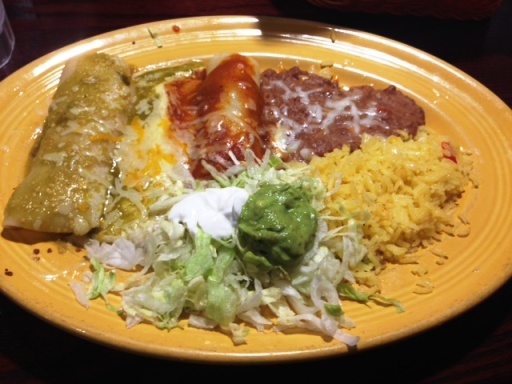 Served side by side, the three enchiladas create the colors of the Mexican Flag. That sounded fun. The dish was attractive to look and it was, as I expected, extremely tasty. I also enjoyed the thin crispy tortilla chips and slightly spice salsa. Being so late, the restaurant was not crowded and it felt so good to have a leisurely meal. Our waiter was attentive. He is one of my favorites at El Vaquero. I don’t know his name, but I will remedy that next time I am in. He is very sincere and friendly and he has the sweetest smile. Not a bad switch at all, for my first today. Sometimes the challenge isn’t finding a first, but being prepared to shift, happily, to plan B or even plan C. It’s all good. It’s all part of being in the flow. Olé!